Like so many things I get involved in, the brief sketch I planned for this spot has gotten completely out of hand. Rather than rein it in, which would take even more time, I’ll include it (below the spinach) but not ask it to do what it was originally intended to do, which was, to explain this photograph. 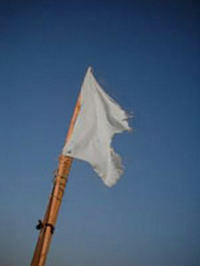 Yes, it’s true, that’s a white flag. I am ready to cease hostilities. My limericks were of course caustic attacks on James, my fellow dueler of the now intercontinental Sock Wars, which have swept up an increasing number of innocent bloggers, threatening the tranquility of their community. My prize is a signed copy of Gardeners’ World 101 – Bold and Beautiful Flowers, by one James Alexander-Sinclair. Yes, same James. Hence the white flag. It’s been a delightful whirl, and I want to thank everyone who danced along. I can’t believe, given some of the things I’ve said, that I got a prize out of it! (And that prize. God knows what James is going to write in it—“To Varlet Kate”?) Both VP and the Monkey have written reviews of James’ book, and if the quotes they include are any indication, it will teach me all sorts of stuff I’ll be better off knowing, which is a sort of take it or leave it thing, but it will also be a hoot to read, which is what I live for. So, folks, this dueler resigns from the field. And none too soon. 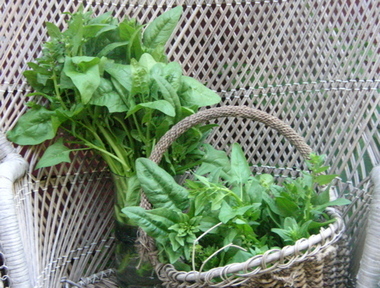 I picked a bit of spinach yesterday that was getting seriously out of hand, and still haven’t had time to wash or stem it. The Brief Sketch: "Speech! Speech!" Scene: A banquet-hall, none too fancy and only half-full; most patrons appear somewhat the worse for wear. A mediocre dinner consisting of large quantities of noodles, overcooked broccoli, and inedible fish has been served, and in some cases, eaten. On the dais, the guest table; at one end, a podium and microphone and at the other, a small table at which sits a single man in a large hat, his back to the rest of the company. One of the women at the guest table is wearing a cheap gold-paper crown. A short woman stands before the podium. Man in hat: Worked just fine for me! (cries from the hall): Ouch! Bloody hell! I think she busted my eardrums! Speaker: Well, I want to begin my little speech today by saying how wonderful it is to see all of you gathered here together, especially, of course, James, even if he insists on sulking in the corner like a wet cat. I’m so glad that two of my country-women, Deb and Daphne, could be prevailed upon to make the trip here with me, and I assure them that those rope burns will be gone before they know it. Of course it’s a special honor to see that Sue Swift has come all the way from Italy for this event. VP (to the Garden Monkey): See? Peace in our time. Deb is squinting at VP’s crown: ‘BP’? I thought her name was VP. VP turns her head regally. It is. BP stands for ‘Bad Poetry’. Of which I am Queen. Daphne: She’s proud of that? There are those who have suggested that Mr. Garden Monkey bestowed the prize on me because he was getting tired of the sock wars. Nothing could be further from the truth, I’m sure, and I’m also sure that I merely anticipate your wishes when I offer to give a short history, written by me, of these wars, first in Middle English, then in a modern translation. (Deb and Daphne look at each other in alarm.) It’s been difficult, but I’ve managed to whittle this down to a mere hour and fifty-four minutes, including time out for sips of water. Deb, whispering: I thought you got her to take out the Middle English! Daphne, likewise: So did I! Oh, perhaps I should explain some of the principles of Middle English? No? The poetics? The prosody? Nothing? Oh, all right, be that way. So drew he to himself the utmost shamme. though of course this prize proves otherwise. I’d like to applaud her—(bows towards main table)— for so graciously coming to witness the celebration of one who is so clearly and in all ways her superior. And now for the modern translation. The Monkey can stand it no more. He struggles to his feet, shedding women like water. Guards! Guards! Below him, the guests are slapping each other with the fish course and throwing socks about. The guards struggle towards the dais. because he did not dare. There is pandemonium in the hall. Deb is throwing socks back at the crowd as they land at her feet. Daphne leans towards the others: Can I come sit with you? The guards are on the dais now; two get the speaker under the arms; as they haul her off, her feet dragging, she makes a swipe at VP’s crown but misses. Speaker: Damn. Let me go! There’s another verse! Wait! The guards keep going, and as she is carried away, trailing her verses behind her, her voice continues. The Monkey gestures at the chaos amongst the guests. Guards—do something. Chief Guard, looking at the near riot below, scratches his head. Do what exactly? Zoë: Hit ’em with a dibber! Karen: You can have my orange one! Deb: I’ve got water balloons! Sue: Sock it to ‘em! VP sinks into a chair and weeps. Victoria pats the Monkey on his bowed head. She’s gone. It’s over. James the Hatted One suddenly rises. Gone? Did you say—gone? He starts doing a jig. Deb jumps down and joins him. As they whirl by the table, the others get swept up, even VP, still weeping but holding firmly to her crown. One of the guards whips a fiddle out from under his coat, another a guitar from his pocket, and a third a pipe from behind his ear. The jig has become a reel, and the brawl below devolves into dance. Far down at the bottom of the hall the Speaker can be dimly seen, dancing with her guards. hahahha, are we done yet? Well, we’ll have to see what James says when he gets back from Scotland. If anything. If I get a package from Britain next week and all it contains is ashes, I might do a little song and dance again. We’ll see. But thanks for your invaluable contributions–bushes laden with socks (you must have been giggling! ), monkeys in trees with water balloons, spaghetti wars, the whole nine yards. Amaaaazing. I’m deeply flattered to have had a part in your fiction. I love the idea of uttering small bird-like cries of comfort. More accurately i’d probably just have fallen off my chair laughing. Again. I knew I’d awarded the prize to the right person. Kate – the tears are rolling down my face for real this time – tears of laughter of course. I love the way you’ve woven Comments from all the other pieces into this as well as the content from the main protagonists. I enjoyed being roped into your celebration. Next time don’t tie them so tight. Thank you all. You’ve been most generous, now and throughout. Ellen (aka OFB): I haven’t studied Middle English (don’t tell me, you already knew that), but when I took Chaucer as an undergrad my totally amazing teacher Harriet Sheridan (I have to give her name, even though she’s dead) required that we write a tale for our final paper. Talk about terrified. She gave us several fabliaux from which to choose, and lots of outs–we could write in poetry or prose, in modern or Middle English–and then we had to explain and defend what we’d done with the little tale we’d given us. Of course I did mine in Middle English iambic pentameter couplets–pages and pages of the stuff, really awful poetry, but revelatory as an exercise. Where and why did you study Middle English? About those original sock wars–I should add them to my page. Give me a starting point, could you? Emma–forever. Well, all of one long day. (That was NOT the plan!) I’d sleep for a week, if I had time, but I need to do some of the work I haven’t gotten to recently. Also, there’s this garden out there . . .
And you, VP–your contributions have been invaluable. I actually was thinking of trying a limerick before you showed up with yours, but they definitely gave me the necessary impetus. Using the comments was great fun–I actually didn’t include everyone’s, but there’s only so much you can do. Well, Daphne, if you’d just come along when I asked you, I wouldn’t have had to use rope at all. She wrote about socks in response to a tag I gave her a few days earlier – just go back a few days from this link and you’ll find it. There’s also a post from her a few days after the above link. I think OFB may have done a few posts on this too! And here’s a post I did in response to the start of Aunt Debbi’s sock poll. BTW the bit about Cyril Fletcher and Gardening Today was in response to some behind the scenes encouragement from The Garden Monkey to write a post about it. I just love the encouragement I’ve had from blogging buddies! Oops – forgot to say congratulations on your Arte y Pico award from Victoria. I feel I’m in very illustrious company, but a bit peeved I can’t nominate you myself! As an innocent bystander who came in in the middle of all this via a few posts by VP, I am still a little bewildered about all the fuss about rocks–oh, did you say “socks”? Well, never mind then. Hilarious post! I thought VP should win the prize for her limericks, but I think you are more deserving. Anyone who can write in Middle English impresses me! Chaucer would have approved. Thank you, Karen. We are counting on you for an epic, Turner-esque painting to commemorate the carnage. VP, thanks for the URLs. With their help, I’ll get to the bottom this! it’s nice to see that hostilities have ended, and that you’ve been recognized for your efforts.